Unidentified tablet shows up on Google's I/O page, could it be the rumored Nexus 8? There has been no shortage of Nexus 8-related rumors these past few months, and, usually, when there's smoke, there's also fire. According to the rumor mill, Google is deep into the development of a new Nexus slate with a larger, 8.9-inch display, and it's HTC that's been tasked with its production this time around, not Asus. Apparently, such a tablet is due for a Q3 release. That's interesting, as Google's minty-fresh I/O conference webpage has an intriguing header image with an unidentified slate in it. Before we get into entertaining the notion of what this could mean, we should say that we could very well be looking at a placeholder device. With that out of the way, we have to note that some rumors did indicate a June announcement, not to mention that the Mountain View-based company has, in the past, used the I/O event as a platform to launch new products. Indeed, we may very well be looking at a still veiled-in-secrecy new Nexus tablet. The image in question doesn't really provide us with too many clues, though if this is, indeed, the rumored Nexus 8, it is apparently coming with at least one front-facing speaker. On the down side, the tablet sports quite the fatty bezels, so compactness won't be among its main selling points. Price would, or at least many would expect -- especially given Google's record with the Nexus line -- though we've heard it said that, this time around, the search giant may be after a more premium pricing tier that will allow whoever ends up manufacturing the Nexus 8 to pack it with the latest and greatest in hardware. In any case, we'll know for sure in exactly a month's time from now (June 25-26th), which is when Google's I/O 2014 event is set to take place. It has blue icons on its notification bar so I'm guessing it's probably not the latest version of Android unless Google is going back to them. I'm putting my hand flat on the Kindle Fire HDX and my middle finger goes a bit beyond the edge of the tablet. If the hand of the person in the pic about the same size as mine, that tablet is definitely bigger than 7". It's the Nexus 10 from the Chrome game demo at last year's Google I/O event. . . It's called a Nexus 10, turned sideways. Carry on, folks. Indeed, it looks very similar. But there are differences between the two if you look closely. No there f***ing isn't, clickbait at its finest. Sure there is. For one, there's a very clear mismatch between the bezels of the slate in the image, and the Nexus 10, which has an all-around, equally-thick frame. Again, it's indeed very similar, and, as pointed out, could be a placeholder or just a messed up render of the Nexus 10. 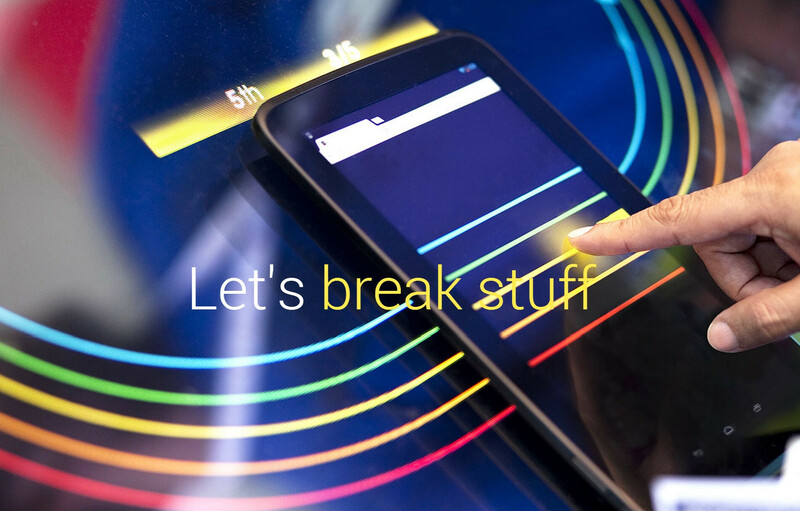 Or, it could be a new Nexus 10, or Nexus 8. We'll know in a month or so from now. Aaargh.... Too much bezel again! It's a Nexus 10, even a blind man would confirm this. This is the very same tablet of last year's ad also, still fooling around. That is from Google I/O 2013. The cross-device game Racer is displayed that was shown. Could it be an early version of a one of the current Nexus devices?